Radiant Orchid is the Pantone colour of the year 2014 and we’re looking forward to seeing use of this bright tone. Whilst we were all caught up in the panic and chaos of Christmas a few weeks ago, the colour experts at Pantone® decided to catch us all off-guard and announce their ‘Colour of the Year’ for 2014. Twice a year the company holds secret meetings with representatives of various international colour standards groups, and after countless debates and presentations, a colour is chosen which captures and connects with the zeitgeist of the moment. This year, it’s ‘Radiant Orchid’. If 2014 is set to be anything like 2013 (where Emerald Green dominated our homes, magazines and catwalks) then we’ll be seeing a lot more of this shade around. A delicate blend of fuchsia, purple and pink undertones – this colour is rich and vibrant, but the pastel tones transform it into a soothing colour that can work well across the tonal spectrum. In the home, it will complement green and blue shades, as well as providing a flash of colour and enlivening neutral tones within your spaces. 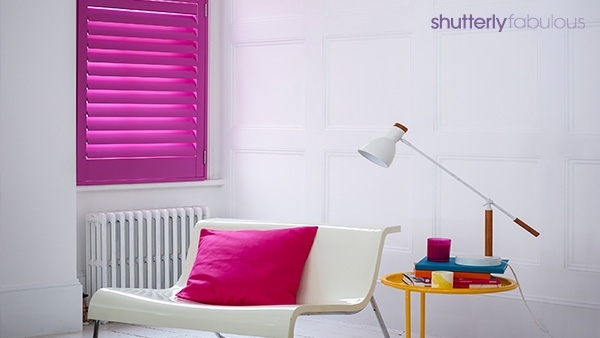 You can incorporate it into your home perfectly by using our colour matching service – simply send us a sample of Radiant Orchid (or any other colour you like) and we can create you a bespoke shutter solution that will create a stunning, on trend impact in your home.